Picture a 32" to 50" TV-like display mounted in the mailbox room, outside an elevator, or above the front desk of your building lobby featuring a beautiful and informative feed of information for residents. A Digital Information Display from CondoSites is just that, and features information ranging from meeting notices, association news, photos, notice of recently uploaded documents, a calendar of upcoming events, and even current weather and time. The feed is displayed in a visually aesthetic and easy to read layout designed to capture the attention of the passing resident. A Digital Information Display from CondoSites will further facilitate and ease building communication for the modern community. The best part about a Digital Information Display from CondoSites is that the information comes directly from your website. That means there are no added steps to publish information to your display. The information you add to your website automatically appears on your display. It really is that easy! Awesome! With a small change in hardware, your Digital Information Display can be transmitted across your association's dedicated TV channel, placing information right on your resident's TV. What's better, you will no longer have to program and update your old system. What do we need to use this new feature? Through our cooperative with Mvix, providers of digital signage hardware, we are pleased to offer our customers turn-key solutions. 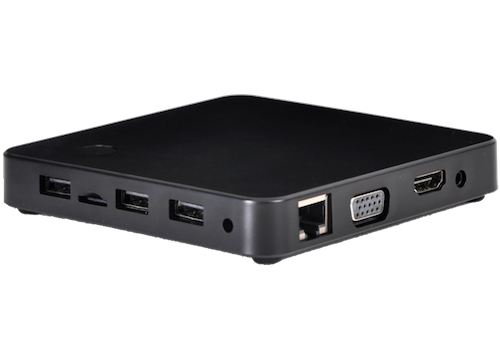 All you need to take advantage of this technology is a 1080p (Full HD) commercial display in the size of your choice, a wired internet connection, and the Xhibit Mykro or Xhibit Lite from Mvix. The Xhibit Mykro and Xhibit Lite are two low-cost, networked signage systems that each provide HD web-content for large display screens. These devices are small, but are powerful enough to beautifully render the graphics and information from CondoSites for your HD display. 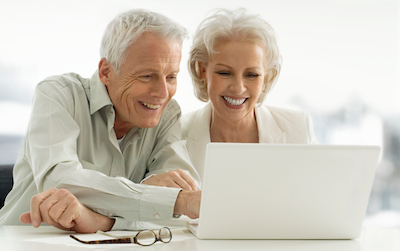 As a value added bonus to our amazing website product, the Digital Information Display web based data feed from CondoSites is included in every community website at no extra charge as part of our all-inclusive product. As a value added bonus to our website product, the Digital Information Display data feed from CondoSites is included at no extra charge as part of our all-inclusive product. Your only cost is the hardware, which will vary based on your design. Feel free to contact us for help with estimates on hardware costs. 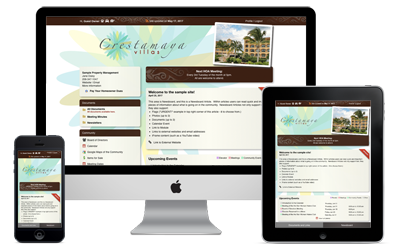 Like our websites, the colors and background art on your Digital Information Display will be customized to match the unique theme of your community. 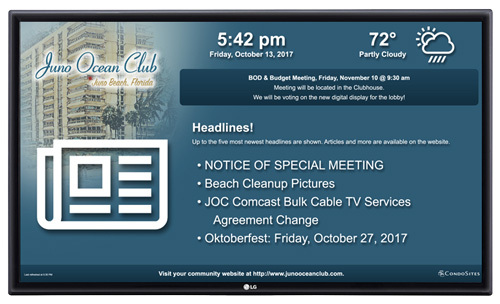 This is a simulated image of the Digital Information Display used at Juno Ocean Club Condominium in Juno Beach, Florida.